Windsor Park is the home of both Linfield FC and the Northern Ireland National Football Team. Located in the country’s capital of Belfast, the stadium is set to undergo renovation work in 2015. Windsor Park first opened back in 1905 with an inaugural fixture between resident side Linfield and Glentoran. Sparse in design, it wouldn’t be until the 1930s that Archibald Leitch lent a hand to the design of the stadium resulting in the current configuration of the stands. The main grandstand which ran to the south of the pitch consisted of seating at the top, and standing spaces known as the paddock below. It was flanked by a terraced goal-end known as the Spion Kop to the left, another terrace area to the right known as the railway end, and a covered standing area opposite to the north. Northern Ireland’s national stadium peaked in the 1960s with a capacity of 60,000, however subsequent renovation work which replaced terrace stands with seating saw the capacity be reduced to around 20,000. The most recent stand to be rebuilt was the Western Kop Stand which was turned into a 5,000 all-seater section in the late 1990s. This followed the replacement of the northern stand which was replaced a decade earlier in 1980s resulting in a two-tiered 7,000 capacity grandstand. 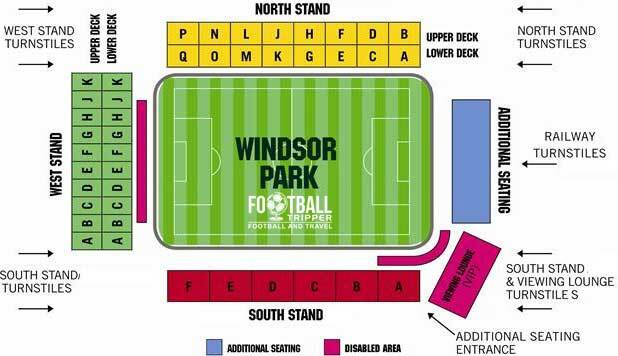 After exploring the possibility of relocation, the Irish Football Association confirmed in September 2009 that Windsor Park would undergo refurbishment to the tune of £31 million. Work began in May 2014 and is set to be completed in November 2015. Away fans are usually housed within the upper tier of the North Stand which was erected in the 1980s. The location of the travelling supporters is likely to change however when the rebuild project is complete. Fans can either choose to drink back within the historic city centre of east of the ground within the area containing the Belfast Botanical Gardens and the Ulster Museum. Whilst you are always guaranteed to be able to purchase a programme, Windsor Park lacks the kind of megastore experience you might expect to find at Europe’s most famous stadiums such as Wembley. There’s always the Linfield FC Superstore which is online 24/7. There doesn’t currently appear to be a stadium tour available of Windsor Park. If this changes after the redevelopment however we’ll be sure to update this section. Tickets to see Northern Ireland play an International match are usually purchased via the Irish FA with the website containing an abundance of information. For matches of Linfield FC in domestic matches of the NIFL Premiership can usually be purchased at the turnstile on the day of the match. Windsor Park is located approximately 2 miles south-west of Belfast city centre sandwiched between the main roads of the M1 and Lisburn Road. As well as being the home of the Northern Irish National Team, it’s also home to Linfield Football Club. There are a limited number of parking spaces located west of the ground directly behind the goal-end stand. Southwards you will find a business park which features a mix of industrial and retail units where you can find some parking – providing that you check the signs! Over four railway station serve Belfast city centre with Great Victoria Street being the most centrally located despite the existence of the confusingly named “Central Stadium” which isn’t very central at all. From most places in the city centre you are no more than 20 minutes away by foot however there is the Adelaide Railway Station five minutes south of the ground. As services depart from “Belfast Central” its often easier to just walk however. Windsor Park is very much an old school stadium situated within the heart of a residential area unlike today’s out of town sports complexes. Lisburn Road east of the ground is served by the Metro Bus number 9A, B and C, and although there isn’t a dedicated stop you should be able to get off pretty close. George Best Belfast City Airport named after the iconic Manchester United footballer can be found 5.4 miles north-east of the city along the Sydenham By-Pass. Whilst there’s not a wealth of options compared to say somewhere such as London, you will find the familiar options of Radisson Blu, Ramada Encore, Hotel Ibis and Premier Inn.